Trousers available in 3 versions of material: denim, ripstop and canvas. Pants available in 12 colors: black, taiga green, coyote, adaptive green, beige, camogrom, jungle green, olive drab, shadow grey, navy blue, mud brown and blue. 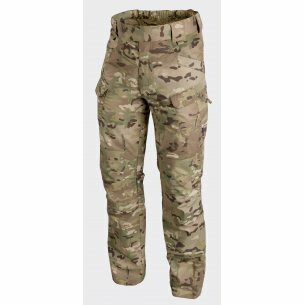 In the pants category UTP - urban tactical line, store hwesta.eu, you will find military / camouflage pants and tactical pants of the highest quality. Thanks to the high quality fabrics of the latest technology and solid performance, our trousers are comfortable, resistant and durable. Experience in the industry and knowledge of the specifics of work in uniformed services means that we choose only those products that meet the needs of professionals. 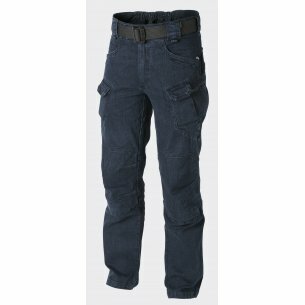 The military trousers and UTP trousers offered by us are made to ensure functionality, comfort and convenience. We want the products in our store to be resistant to damage and wear, do not restrict movement, and help when working in difficult conditions. 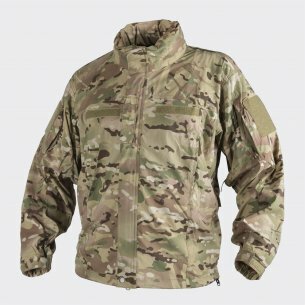 We encourage you to familiarize yourself with the full range of our products dedicated specifically to active men prepared for work in all conditions. 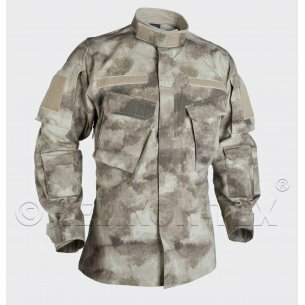 We try to ensure that the shirts we offer meet special needs resulting from the nature of work in uniformed services or passion, which is survival or extreme tourism. Helikon Tex is a leader on the military equipment market. 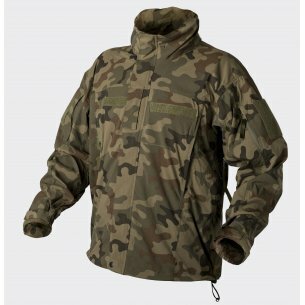 The company offers tactical equipment and combat clothing for the army, special forces, police and outdoor enthusiasts. In this category, we offer you a dozen or so models of men's UTP trousers and militias in the following colors and camouflage: Black, Khaki, Camogrom®, Coyote / Tan, MultiCam®, Jungle Green, Denim Blue, Olive Drab, Pencott® GreenZone®, Navy Blue, Shadow Gray, Mud Brown, Adaptive Green, Taiga Green. 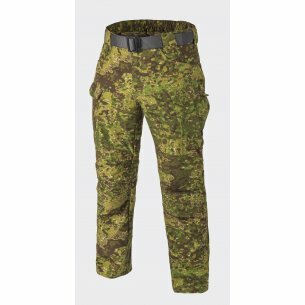 Among Men's Helikon Tex trousers, you will find, among others, the Urban Tactical Flex Pants® model made of one of the most durable materials - NyCo. The comfort of use, of which UTP® pants are known, has been ensured by combining the inflexible NyCo with the VersaStretch® air suspension in the step and in the yoke. UTP trousers are equipped with thoughtful pocket systems, allowing the user to place the equipment close to the center of gravity - around the waist and hips. The edges of the back and front pockets are further reinforced to withstand the insertion of clips from torches or knives. 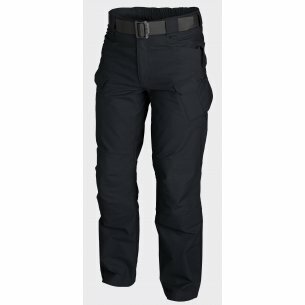 Another improvement is placed on the knees internal pockets, intended for inserting low-profile inserts to increase the comfort of work. The models are designed so that it is also possible to transport large items, such as the AR / AK magazine, for which pockets on the front of the thighs are ideal. Helikon tex UTP urban tactital pants are equipped with an elastic waistband and Velcro closure, which allows them to be perfectly adjusted to the wearer. 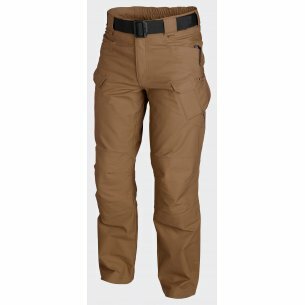 Among the models you can find both pants in military style, as well as those that retain a civilian look, while having wide loops, matching EDC, Cobra and UTL belts (up to 50 mm wide). 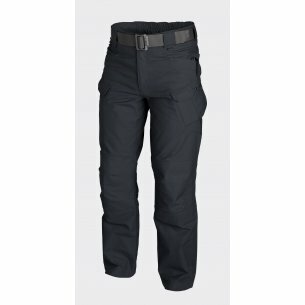 RIPSTOP - UTP men's trousers made of Polycotton Ripstop fabric (60% Cotton, 37% Polyester, 3% Spandex), equipped with 2 normal front pockets, 2 back pockets, 2 cargo pockets with zippered legs and 2 small with flaps Velcro. 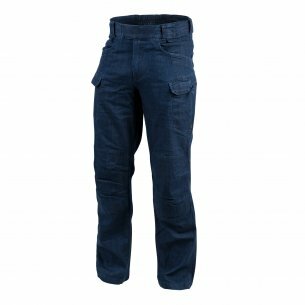 PolyCotton Canvas - tactical pants Helikon Tex made of Polycotton Canvas with an admixture of elastic spandex, with less uniform appearance. They are equipped with 2 normal front pockets, 2 back pockets, 2 cargo pockets on the legs with zip and 2 small ones with Velcro flaps. Tactical pants and militias Helikon Tex is an excellent choice for enthusiasts of outdoor activities and employees of uniformed services. 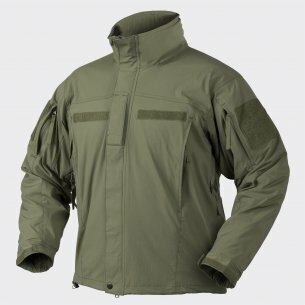 These products are durable and comfortable, which thanks to such facilities as profiled knees or compatibility with Helikon Tex protective inserts will work even in the toughest conditions.